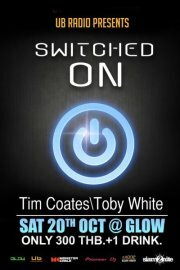 DJ MEAN (Thai), DJ OATAWA (Thai), DJ Kolor One etc..
DJ ONO and Guest DJ from Q BAR. *donating 1500 baht per bottle of Grey Goose sold for the entire week and on Wed we will also donate 200 baht per paid entry. 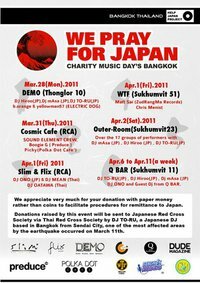 Donations raised by this event will be sent to Japanese Red Cross Society via Thai Red Cross Society by each participating venue & DJ TO-RU, a Japanese DJ based in Bangkok from Sendai City, one of the most affected areas by the earthquake occurred on March 11th. We appreciate very much for your donation with paper money rather than coins to facilitate procedures for remittance to Japan.